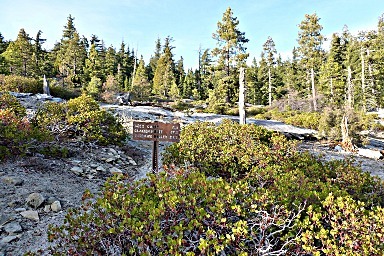 In the early Spring and late Fall, many trails of Yosemite are not easily accessible. 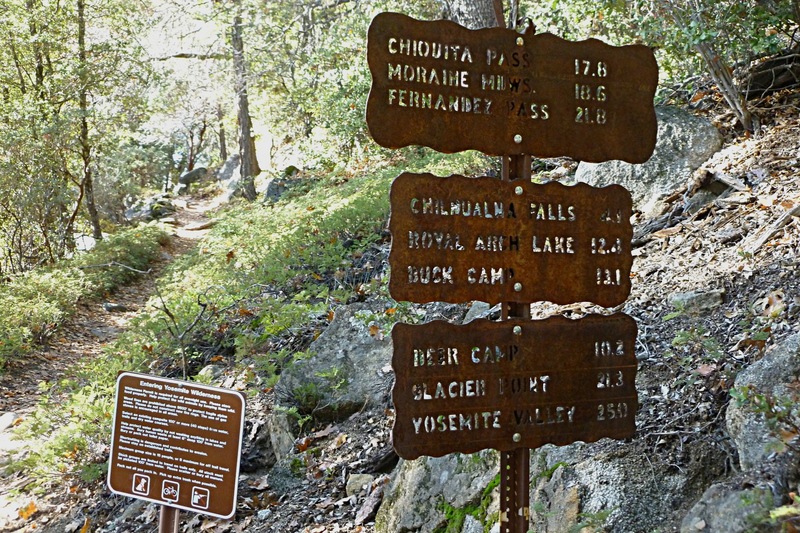 An exception is the Chilnualna Falls trail that starts near Wawona. 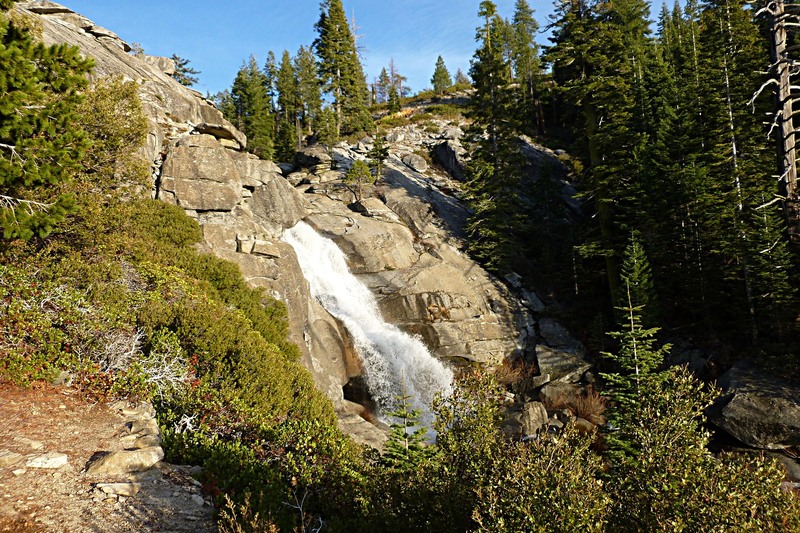 It offers two sets of waterfalls, a 2300' elevation rise, and after 4.2 miles, a beautiful open rest area above the upper falls. Since the trail is on the south-facing side of a canyon above Wawona and starts at 4200', it is likely to be free of snow at the early and late extremes of the hiking season. The upper end along a granite wall, however, can be trecherous if covered in snow or ice. 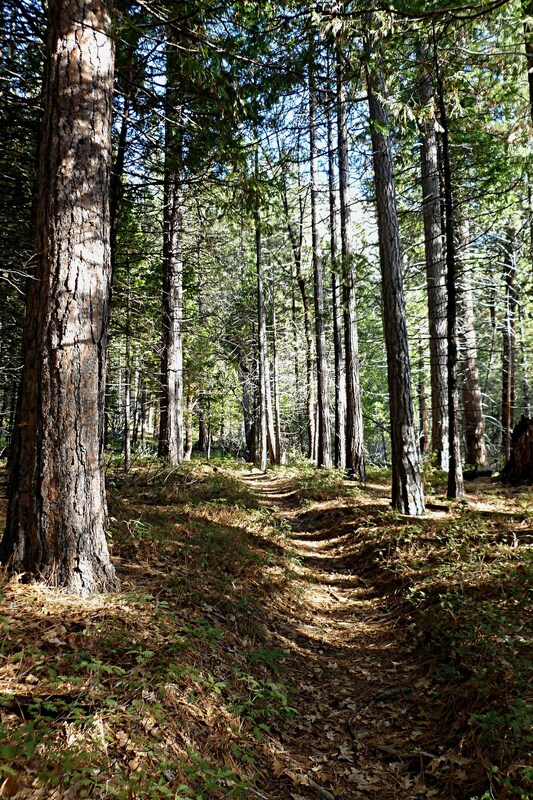 In the hot days of summer, however, I prefer to hike trails at higher elevations. After passing the Wawona Hotel and a bridge while driving north from the south entrance of the park, a side road goes to the right past a post office, school, private cabins, and the Redwoods rental cabins and approaches the point where this picture was taken. 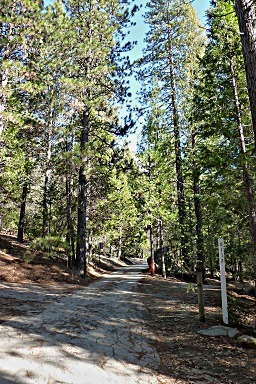 Behind this point on the right side of the road is a 300' driveway down to the parking area for hikers. 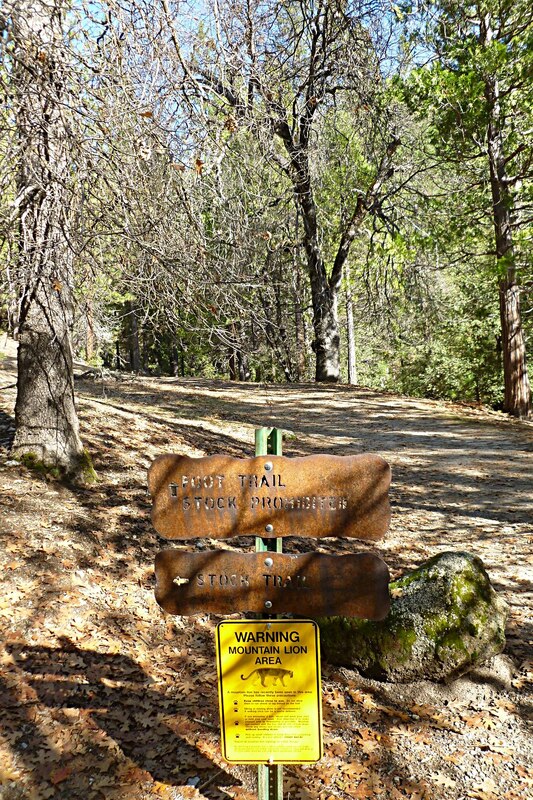 Walking a short distance farther down the road, you reach the official trailhead with these signs. 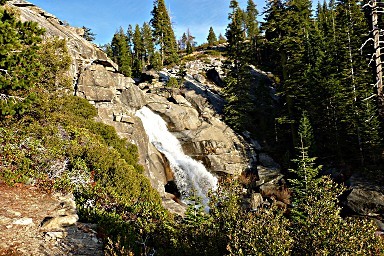 The stock trail and hiking trail meet above the lower falls. 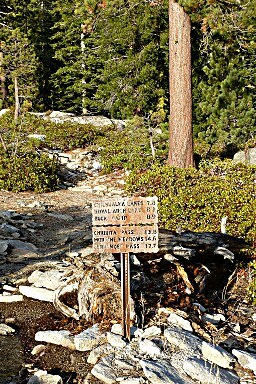 The hiking trail has some steep parts where one could slip off into the stream so small kids should be supervised carefully. If returning in the dark, it is better to come back down via the stock trail which is much longer and meets the access road before the Redwoods Cabins. I have never seen mountain lions on any hikes anywhere although they have probably seen me. Still, since this is deer country, mountain lions are likely to be present and the precautions provided by the lower sign are worth heeding. In short: Keep children close. Don't run. Stand tall. Fight back if necessary. Mountain lions don't want to risk getting hurt; they want a quick easy kill. This is also bear and rattlesnake country. Don't annoy them. 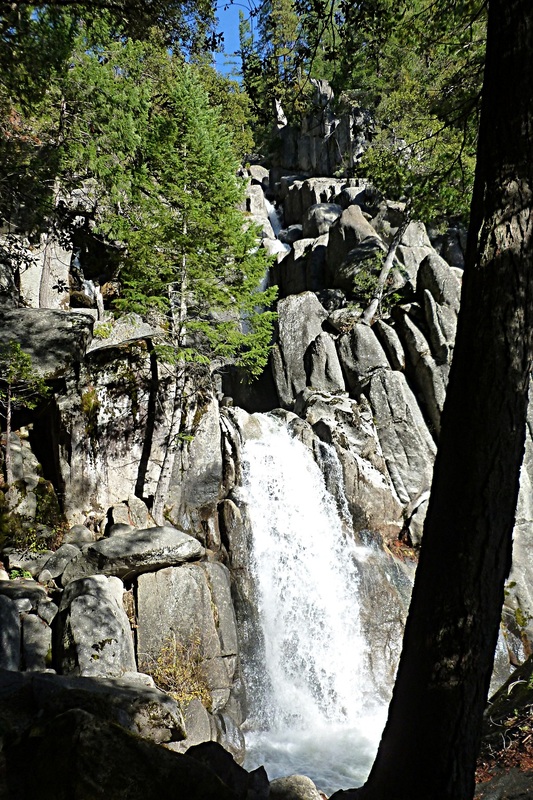 Lower Chilnualna Falls shown here are quickly reached on the hiking trail. Just after leaving the lower falls, the hiking trail joins with the stock trail and these signs indicate distances to various possible destinations. 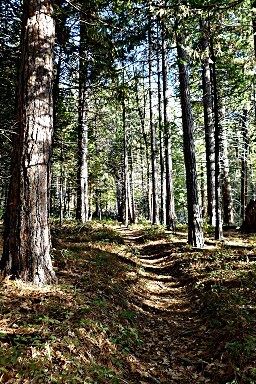 The first part of the trail gradually ascends through woods like this. At one point where it momentarily opens on flat granite, be careful not to loose track of the trail. 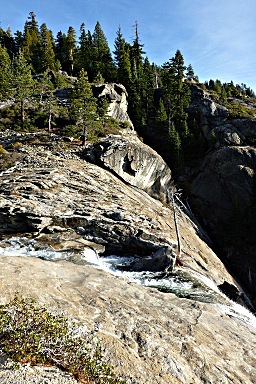 Upper Chilnualna Falls is just visible coming over the granite at the upper central part of this picture. The water drops into a sideways ravine that is not visible. 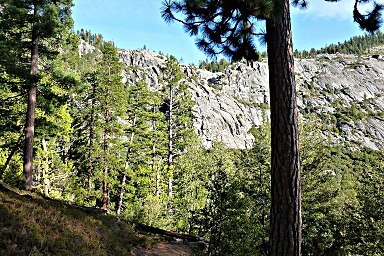 The trail approaches this spillway from the left side along the granite cliff. The trail reaches the stream again at the spillway of the upper falls. It is best to not try and get a better look than this view from the trail. A short distance farther up brings you to this cascade. Another short distance later, one reaches a "Y" in the trail. These signs show the options.